We are the highly reputed in manufacturing Impact pulveriser. These are designed by our effective engineers and developed using the advance and latest methodologies. Impact pulveriser is exported worldwide and are demanded for long life, durable, reliable operation and optimum performance. Clients can available these at reasonable prices. 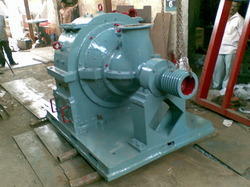 Impact pulveriser is one of our products. The D. P. Impact Pulveriser are used for a wide range of application e.g. Agricultural Chemicals, Carbon & Graphite, Coal, Coke, Coconut Shell & Wood Saw Dust, Clay, Dye Stuff & Pigments, Detergents, Ferro Alloys Fertilizers, Fillers, Food Products, Herbs & Spices, Insecticides and Pesticides, Katha, Marine feeds, Minerals, Plastics, Pharmaceuticals, Resins, etc. The D.P. 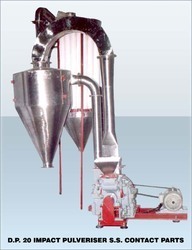 Impact Pulveriser consists of an encased rotor carrying swing hammers, whizzer classifier for fineness regulation, and Blower Fan mounted on a solid shaft. Raw material to be pulverised enters the crushing chamber through the hopper and automatic rotary feeder. The impact of the hammer on the feed material against the Liner plates reduces it into fine powder. The ground material is carried towards the whizzer classifier for classification and the oversize particles are rejected by the classifier and returns to the crushing chamber for further grinding. The classified material is then conveyed into the cyclone for collection and bagging. 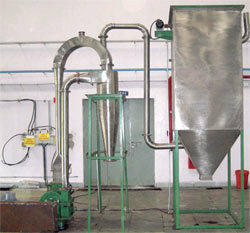 A dust collector is provided in the system for ensuring dust Free operation and no loss of ground powder. Fineness Range 60 - 325 Mesh B.S.S. Impact Pulverizer (Without Internal Blower) offered provide for perfect support for handling of impact, grind and crushing of target materials with granule size achieved through changing of screen. Further, the system provides for solid and stable running support as well as superior working efficiency as desired and demanded by the customers. Further, the system also allows for direct discharge of crushed material from grinding chamber of main frame with its stainless steel construction finish making it provide for lasting service usage. Some of its features include smooth inside walls for avoiding powder accumulation on inside walls; suitability for use in industry sectors like chemical, metallurgy, foodstuff and others. 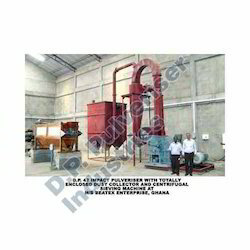 we are one of the leading Manufacturer & exporter of Impact Pulverizer Stainless Steel Contact Part in Mumbai, India. Impact Pulverizer is one among the wide range of Industrial Crushers that is designed for medium fine grinding of soft or semi hard materials. It offers versatility of operations and prevents blocking or build up of deposits such as fatty or sticky substances. It offers cool operation to retain colour, flavor and taste of the product. It is also used for other operations such as pulverizing, grinding, mixing, dispersing, and de-agglomeration with help of different grinding elements. It allows choice of material for hammer and liner to match the type of material for superior output with less wear and tear. D. P. 15 Impact Pulveriser offered find extensive use in industry sectors like pharmaceutical industry, foodstuff industry, chemical industry, pesticide industry and others and can be made available in different configuration options to match up with specific processing needs of the customers. Making use of relative motion between movable and fixed teeth disc, the system also provides for stable operations as well as superior crushing efficiency. Some of its features include allows for efficient discharge of material through grinding chamber; allows for crushing support for different size raw material; assures processing in conformity with requirements of GMP. Looking for Impact Pulverizer ?